Just minutes after unfurling a 50-foot banner on the side of the A.J. Muste Building in Manhattan (also dubbed the “Peace Pentagon” for the nonviolent social change organizations it houses) a friend called to tell me that two police officers had been shot, execution style, in Brooklyn. I was composing a Tweet about the banner but deleted it mid-phrase. 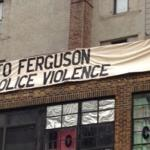 The banner reads: “NYC to Ferguson: End Police Violence,” and it was sponsored by the Campaign to Bring Mumia Home. Should you stick with the devil you know?